Today on my way back to Delhi was roaming around in the book shop in Mumbai airport when I came across your book. Well unable to start my weight loss plan which have been planning since 6 months, thought at least reading about some book on weight loss might make me feel better. Finally read the last page, after reaching home today have spent very little time with my wife and darling daughter to resume reading. I used to be skinny guy before IIT tradition of eating maggi or drinking till late turned me into normal weight category and post 7 years of my job wherein what started as social drinking has made me so social that I need to drink atleast once in 2 days. Till a couple of years back, colleagues to relatives used to tell me how young I look and now recently while playing cricket I couldn't digest small children playing nearby addressing me as UNCLE and same children addressing my colleagues as Bhaiyya....man it was worse than all the m/c b/c abuses. Last week purchased zero carb iso pure protein and started gym, but after 2 days had an excuse that my Japanese client who irritated me so much that by the time I reached home my plans shifted to next monday or even better next month starting 1st onwards. Wish to get back to my 60-62 range from current weight of 78 and will definitely let you know the day I have reached my ideal weight. I've finished reading your book in 3 days time and its truly inspirational. I'm 25 and a little on the heavier side of the weighing scale for my height. You ve brilliantly written about the mindset of a heavy person, I could relate with every single thing! :) I'm totally motivated and am starting with a diet and workout plan right away. Thank you for sharing your experiences! I ve recommended your book to a lot of people...I've actually enjoyed every bit of it. Good luck to you for your endeavours. It's late for a congratulatory message by an average Delhi standard however wanted to congratulate you for you book. Thank you for sharing and writing! Hats off to u ! I wonder if u will really read my mail. U R such a great motivator and I read book within 3 days that is I get only 2hrs everynight after my kids go to sleep. I have to return the book, I borrowed it from the library and I want to own the book now. I go to the gym they do weight and it is not enough for me I am stuck with 52kgs anf 4.8ft tall a little too much for my weight. Nothing looks good on me my bum popping out behind. I am homemaker 34yrs old. I Learnt that cardio is the one which burns fat and I also want to enroll myself for yoga. Thank u very much for writing this book. I Really love you and your book. Wanted to c ur photo in the dress fr the french wedding. On serious note its difficult to openly talk bout the weight issue..supplemented wid pics. Myself also struggling to lose weight...m 34 no no wil turn 34 on sep 12... Weighing 80 wid a slipped disc. 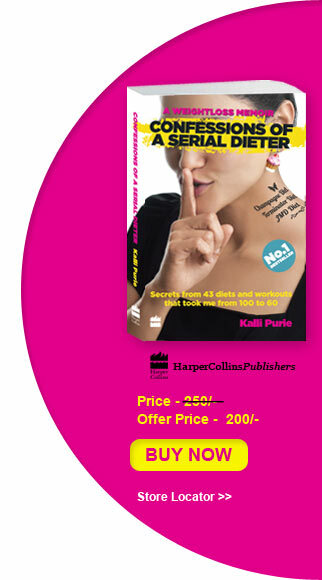 I am on page 41 of ur book and believe me I have not come across something so good on dieting before , all the journals and secret mantras to lose weight are faux pas . I have never met u , maybe never will,,, but Kalli I feel very connected .... Maybe because this is the kind of stuff I wanted to read ... The emotional connect with food . I shall keep writing more emails to u as suddenly as this one again when I feel the strong urge on reading some page. Thanks a lot for this brilliant work of yours. My name is Amrita and just wanted to thank you and congratulate you on writing such an honest and helpful book. I usually don't pick up self help books, but yours I read in one go, in one day, I am not kidding. I have struggled with weight for over 15 years, from being a ripped stated level handball player at 55 kgs to now weighing some 100 kgs. Running is my salvation too and I have run two half marathons which was my last "good" phase. Anyways just when my hot bod and awesome sis was helping me get on the right track, I chanced upon your book so its really a great motivator. Just wanted to say, everyword resonated with me and hit right home.